We frequently prepared Vadas but then we would also like to serve it with a sweet. 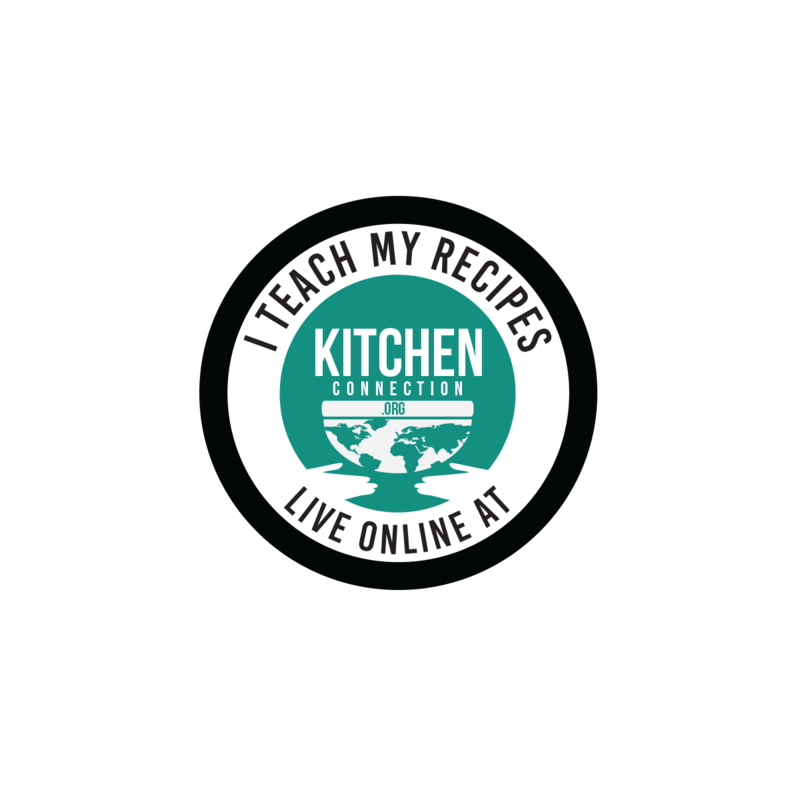 For this Urad Dal Jamun is a good idea. As you can create a tasty sweet with very minimal extra effort. This Jamun is as tasty as normal gulab jamun. 1. Mix the water and sugar together in a wide bowl. Bring it to boil till the sugar dissolves completely. 2. Then strain the syrup to filter the impurities. Again bring it to boil and add cardamom powder. Cook till the syrup becomes little bit thick but before the one string consistency. 3. Add rose essence if you want. Sugar syrup is ready to use. Note: Make the sugar syrup after the batter is ready. 1. Wash and soak the urad dal for 1 hr to 1 ½ hrs. Then drain the water completely. Grind it into a smooth and soft paste with very very little water. The batter looking like butter is the right consistency. Grind it using a mixie or grinder. 2. Take the batter out of the mixie or grinder and transfer it into a wide bowl. Add 1 tbsp of maida. Mix them well with your hands. 3. 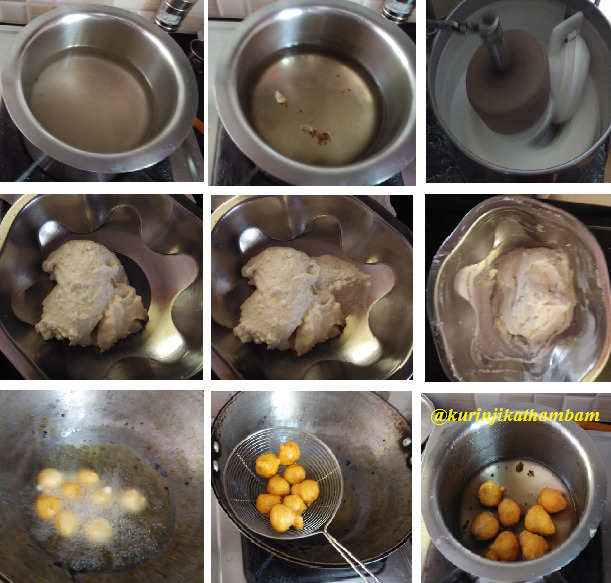 Heat the oil in a pan, wet the hands with water and drop gooseberry size balls into the hot oil. Keep the flame at medium only. 4. Fry them well on all sides till they become golden yellow color. 5. Take it out from the oil and drain the oil completely. 6. Immediately put them into the already prepared hot sugar syrup. Leave it for 15 mins and then serve. 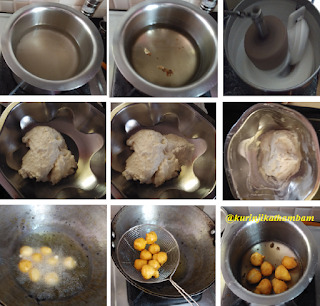 Soft and easy gulab jamun is ready. 1. You can keep this for 2-3 days at room temperature. 2. Grind the dal using the grinder, you can get more jamuns then grind it in a mixie. 3. If batter is little bit watery, add one more tbsp of maida. But more maida gives hardness to the jamun. 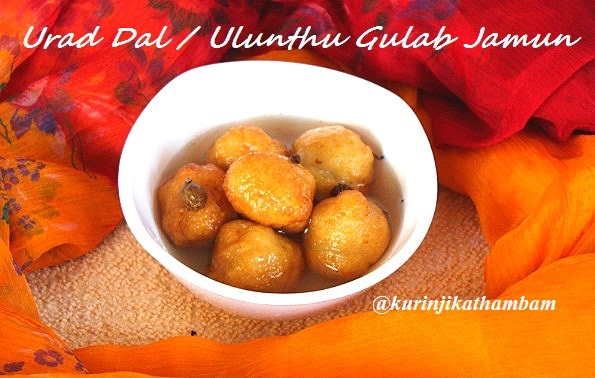 Click here for Bread Gulab Jamun recipe.